Yoko Ono continues to oppose any effort to grant parole to Mark David Chapman, John Lennon’s assassin. Chapman shot and killed Lennon at point black range with a hand gun using hollow point bullets as Lennon and Yoko Ono returned to their apartment, the Dakota, a luxury apartment just off Central Park West in Manhattan. On August 22, 2012 Chapman was denied parole for the eighth time. Representing Yoko Ono, as he did often in the past was entertainment lawyer, Peter Shukat. Shukat not only personally represented Yoko Ono but also the estates of Miles Davis, Jimmy Henrix and Bob Marley. Peter S. Shukat, a founding partner of New York-based entertainment law firm Shukat Arrow Hafer Weber & Herbsman, died on June 7, 2013 – a month ago – after a ten-year long battle with cancer. His obituary appeared throughout the music industry, including in Music Week, Jazz FM, Billboard.com as well as the New York Post, The New York Daily News and The New York Times. 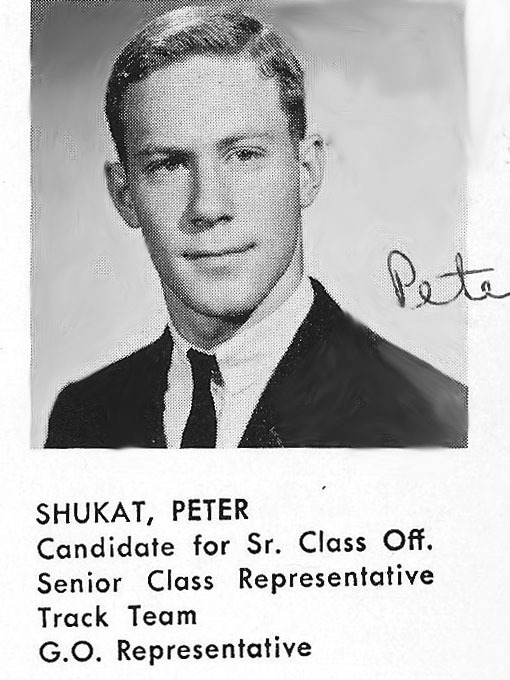 Shukat graduated from American University in Washington DC in 1966 and then from Brooklyn Law School in 1969. Prior to that Shukat went to Jamaica High School in Queens, New York where he ran track (the 440 yard dash , which he ran in less than 55 seconds – an impressive time in the day). It is not surprising that Shukat went into what is called “entertainment law.” He came from a family that was involved in the entertainment industry with his father and older brother working for the William Morris Agency. Shukat was a childhood friend. We spent a lot of time together in high school. I can still picture his home not far from 164 St. and Union Turnpike in Jamaica. We went to junior high school (Van Wyck Junior High School 217, Queens together) and then to Jamaica High School from which we graduated in 1962, an extraordinarily academically fine and racially integrated high school, the likes of which is uncommon these days – the best of New York City public education. I lost touch with Shukat for a very long time – more than 40 years – as I moved west to Colorado looking for a new life from what appeared to be the life track into which I was born into and headed. But several years ago, briefly, we reconnected, along with another friend from those early days, Robbie Lieberman. It must have been in 2008, 2009 as it was prior to the death of my mother (July, 2009). The three of us met at a restaurant on the Upper East Side of Manhattan (something like 92nd Street and Third Ave), owned and operated by one of Shukat’s sons. We had a fine evening together and I was glad to touch base with both of them. If after such a long time, our connection was not “intimate” – it was still marked by warmth, affection and respect. When my mother died, shortly there after, I bumped into Peter in front of the funeral home where my mother’s body was on display for a final viewing. It was a bit of an odd coincidence. I did not know that Peter had been suffering from prostate cancer; he didn’t mention it that evening we met in Manhattan. He and Robbie L. had theorized that the reason I had not gotten in touch over all the years was because I had probably “joined the C.I.A.” When I suggested that, “well, no, I’d `gone the other way politically’” they laughed. Peter said, “we understand, people in the C.I.A are not supposed to talk about it; it’s ok.” I had no idea that Peter had made such a mark in his field until reading the obituary. I found out about his death from one of my sisters who had heard of it from another classmate of mine and family friend of ours, Louise, one of the triplets – daughters of my mother’s best friend, Muriel Been. Mostly I am impressed with my old friend’s humanity which comes through in many of the obituaries, comments from family members, etc. My ex husband called me tonight to ask if I knew that Peter Shukat died. He said that he was watching the Grammy Awards and it was flashed on the screen during the “In Memorium” section of the show. No, I didn’t know – why would I? On occasion I have thought about those high school days and wondered where you all were, but it’s been sooooo many years . . . I googled Peter Shukat and found your blog. There you were, “Robbie” Prince, talking about Peter and your get together with him and Robbie Lieberman. I don’t remember too much about those days, but I certainly remember the three of you. Last month I was visiting my son and his family in Los Angeles and I had dinner with Karen Gottlieb. We don’t see each other often, but it’s always very special for both of us. I was very sad to hear about Peter, but very touched to read your tribute, and see the picture that I remember so well. I’d love to hear about what you and Robbie Lieberman are doing now and reconnect. Thank you for your poignant post. I had the pleasure of meeting with and working on a project with Mr. Shukat beginning in 1985, when I brought the estate of the late rock founder Bill Haley to him. Mr. Haley had died suddenly in 1981, leaving a convoluted and complex estate his widow (who spoke primarily Spanish) was ill equipped to sort out. Within the next five years, we had the entire estate straightened out, updated, and all the various monies held in escrow, tracked down and sent to Mrs. Haley.